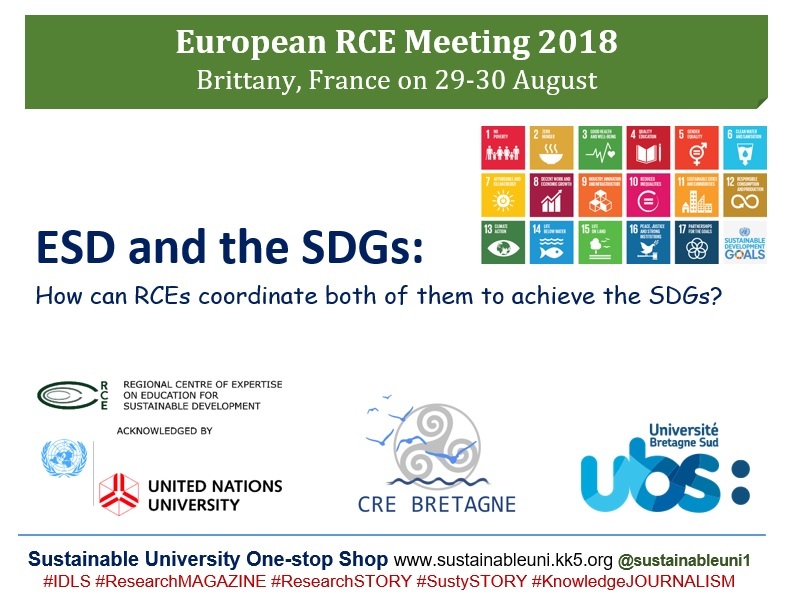 The European RCE (Regional Centres of Expertise) Meeting 2018 will take place at the University of Southern Brittany (Université de Bretagne Sud), on 29 and 30 August 2018, in Vannes, Brittany, France. The meeting’s overarching theme is ESD (Education for Sustainable Development) and the SDGs (Sustainable Development Goals): how can RCEs coordinate both of them to achieve the SDGs? Organised by the RCE Brittany, this annual event will bring together the members of the RCE community from nearly 20 countries in Europe. Turning to the global RCE network, as of August 2018, 165 RCEs have officially been acknowledged by the United Nations University worldwide. These RCEs aim to translate global objectives into the context of their local communities. Kingston University London hosted a meeting of the partners of the London Regional Centre of Expertise (RCE) on Education for Sustainable Development (ESD) on 8 June 2012. Coordinated by London South Bank University (LSBU) and supported by other London universities including Kingston University, University of East London (UEL) and Queen Mary University of London, the London RCE is a diverse network of individuals and organisations from education, state, business and voluntary sector committed to Education for Sustainable Development in their respective areas. It is part of the 100-member Global RCE Network being developed by United Nations University. The University of East London (UEL) hosted a meeting of the partners of the London Regional Centre of Expertise (RCE) on Education for Sustainable Development (ESD) on 24 February 2012. Coordinated by London South Bank University (LSBU) and supported by other London universities including UEL, Kingston and Queen Mary University of London, the London RCE is a diverse network of individuals and organisations from education, state, business and voluntary sector committed to Education for Sustainable Development in their respective areas. It is part of the 100-member Global RCE Network being developed by United Nations University. The next partners meeting will be hosted by Kingston University in June 2012. The University of East London (UEL) hosted 2011’s last meeting of the partners of the London Regional Centre of Expertise (RCE) on Education for Sustainable Development (ESD) on 9 December 2011. Coordinated by London South Bank University (LSBU) and supported by other London universities including Kingston, the London RCE is a diverse network of individuals and organisations from education, state, business and v oluntary sector committed to Education for Sustainable Development in their respective areas. It is also a member of the 88-member Global RCE Network being developed by United Nations University.